The western part of Noord-Brabant was not as important as the coastal regions but there were some strategic rivers and bridges. Two inland batteries were erected north of Bergen op Zoom to defend this city and her harbour. Further north one will find several 612s along the Volkerak up to Willemstad. Stp Gr Moerdijk was quite a fortified area, however only a couple of St bunkers survive here. This area was defended mostly by Armenian volunteers. Geografically it lies in two provinces, but we keep it together and cover it here in the province of Noord-Brabant. Additional pictures over the years were taken by Henk Adriaanse. 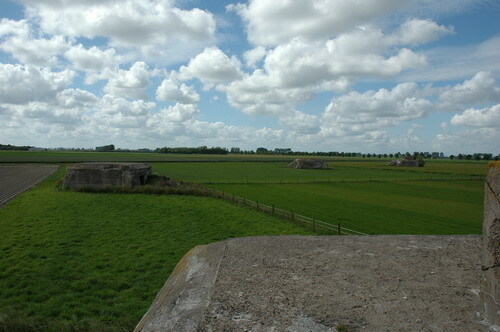 Fieldbattery at Lepelstraat near Bergen op Zoom.